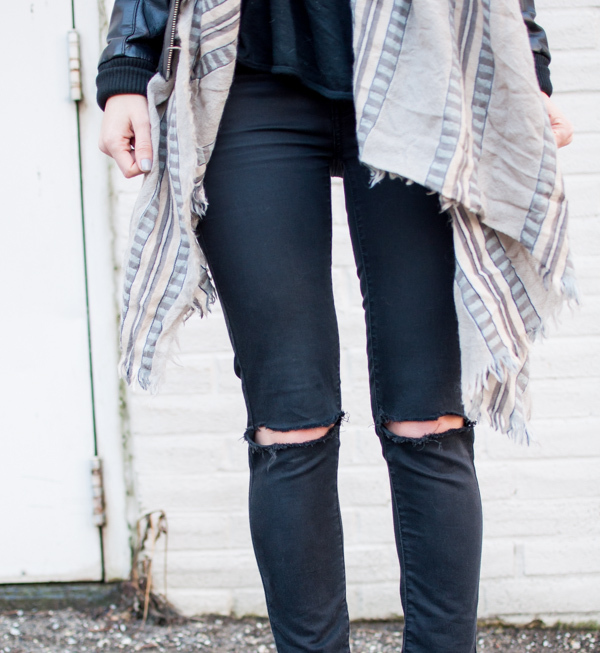 OOTD - Aritzia Blanket Scarf for Winter | La Petite Noob | A Toronto-Based Fashion and Lifestyle Blog. Happy holidays Noobs! Today is going to be a super quick, super casual outfit since my brain is still a little fuzzy from overindulging in food and drink for the past three days. You've seen this Aritzia coquette blanket scarf in a previous post, and today I've styled it to be more winter appropriate. Read on for additional photos and outfit details. I honestly haven't been able to take these destroyed black jeans off this entire holiday season. I love the distressed look, and it was incredibly easy to DIY - check it out here! I hope you all had an incredible holidays! I've been trying to find a huge scarf for winter, yours looks so comfy! This one is very cozy, and lightweight so it's comfortable to wear!